Engaging lifestyle video comes in all shapes, sizes, and lengths. As part of the POPSUGAR Insights/ulive 2014 lifestyle video study, we asked women to share the types of videos that they typically watch on specific devices to identify trends that content creators can consider when making content available to consumers on various platforms. Overall, short videos (videos that are less than 4 minutes in length) are most often watched on mobile phones (71%), tablet computers (55%), and laptop computers (46%). Medium videos (4-20 minutes in length) are most frequently consumed on larger screen devices like laptops (61%), desktop computers (54%), and tablet computers. 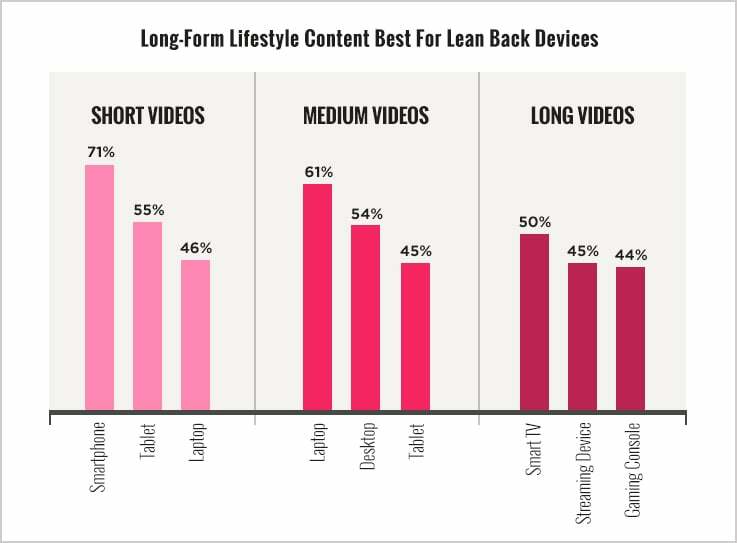 Long videos (videos over 20 minutes in length) are most often streamed on lean-back devices like smart TVs (50%), streaming devices like the Apple TV, Roku, or Chromecast (45%), or a gaming console (44%).